Hats off to all the board and volunteers for another successful Intermountain Logging Conference held April 12-14 this year at the Mirabeau Park Inn and Convention Center! The 74th was blessed with good weather, great attendance, and a fine lineup of speakers and sessions. The machinery dealers really went out of their way this year with more equipment than we have had in a long time. 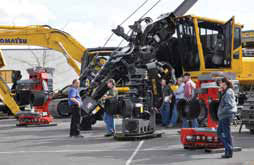 The best estimate had us at over $10 million of the best and newest in logging iron for the attendees to view. 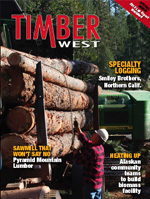 Our 3rd annual Log Loader contest was a success as well. This year, we added a water bucket relay and a mini backhoe basketball toss to the list of events. Lots of fun to watch the guys go through their paces! Of course our world famous tailgate party and auction was well attended and a fun time for all. The theme chosen by Vice President and Program Chair Mark Mahon was “Profit – It’s Not a Four Letter Word.” Presentations were centered on improving the bottom line, pure and simple. The show started off with various technical sessions including a live welding demonstration. Mike Kralicek, a former logger and policeman disabled in the line of duty, gave a stirring keynote address on continuing through adversity. Panels and breakout sessions continued on subjects including current market trends, logging safety, and the newest trucking innovations. All in all, the 74th ILC enjoyed a great turnout and a wonderful show. Attendance continues to increase over recent years, and both attendees and vendors seemed excited about doing it again next year. Thanks to all who helped put this great event together. We couldn’t do it without you.